IEEE Robotics and Automation Society– Egypt Chapter competition "Minesweepers: Towards a Landmine-free World" has been featured in November 2013 issue of IEEE The Institute. 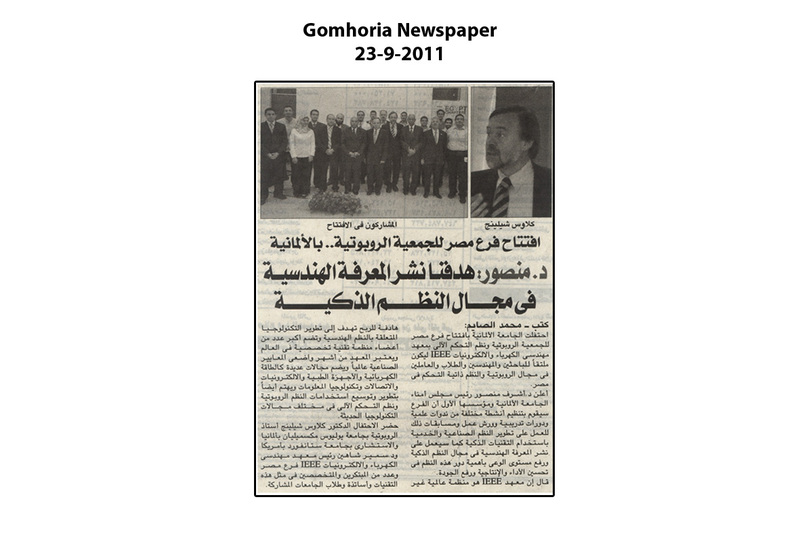 Final round of the IEEE RAS– Egypt Chapter competition Minesweepers: Towards a Landmine-free World has been covered by TV and newspaper media. 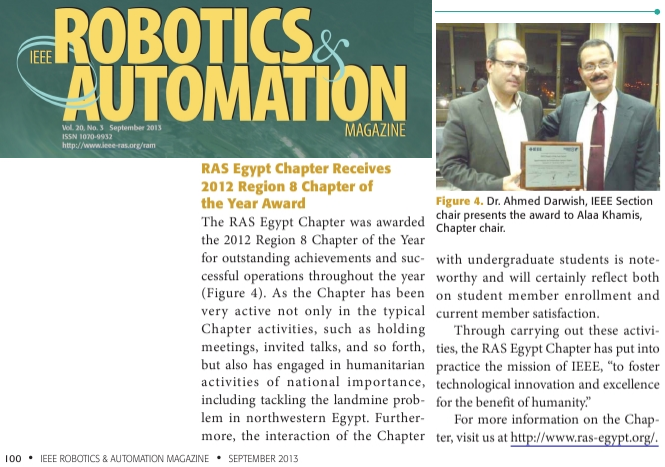 IEEE Robotics and Automation Society– Egypt Chapter has been featured in September 2013 issue of IEEE Robotics and Automation magazine. 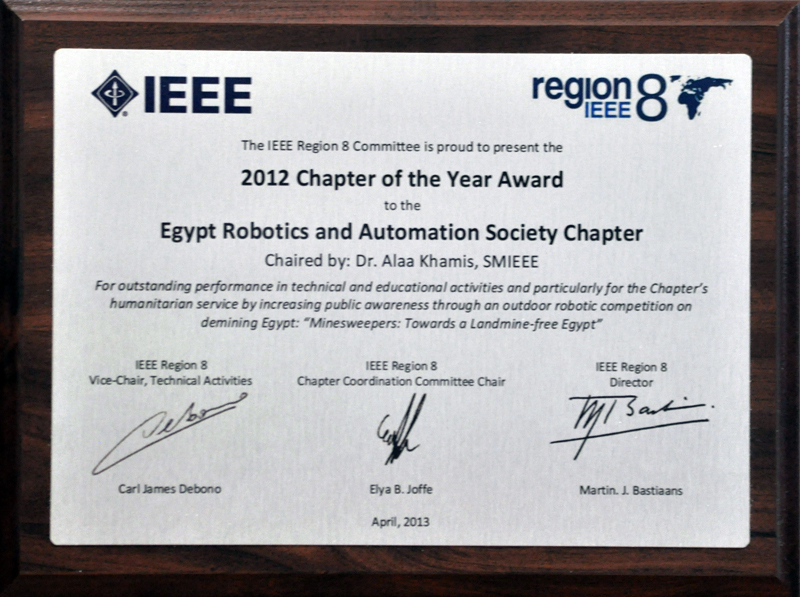 IEEE RAS Egypt Chapter wins the2012 Chapter of the Year Award in IEEE Region 8 (Europe, Middle East and Africa). 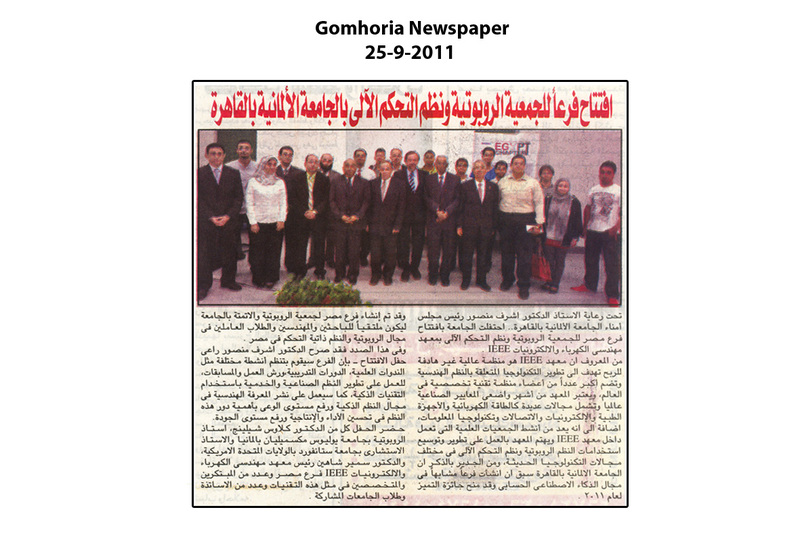 IEEE RAS Egypt Chapter in IEEE Robotics and Automation Magazine. RASTalks have been covered by local media. Robotics competition Minesweepers: Towards a Landmine-Free Egypt in the area of humanitarian demining in Egypt. This competition will raise the public awareness of the role of science and technology in solving this problem and will motivate professors, engineers and students working in this pertinent area of national importance. The competition is organized by IEEE Rbotics and Automation Society - Egypt Chapter and is sponsored and hosted this year at the German University in Cairo. IEEE Robotics and Automation Society - Egypt Chapter free intensive course about "How to build a real robot"
Launch event of the IEEE Robotics and Automation Society (RAS) Egypt Chapter under the honorary patronage of Prof. Dr. Ashraf Mansour, GUC Prime Founder and Chairman of Board of Trustees. Distinguish Lecture has been given by Prof. Dr. rer. nat Klaus Schilling, Professor and Chair of Robotics and Telematics Lab, Julius-Maximilians-University Wurzburg, Germany and Consulting Professor at Stanford University, Department of Aeronautics and Astronautics, USA.